As an Internet-oriented crafter, I’m exposed to a whole lot of wonderful things and ideas. Pinterest, Instagram, and Facebook offer a plethora of inspiration. We’re inundated with visuals, words, and ideas that seep in to our subconscious and inform our crafting sensibilities. It’s a beautiful thing. Sometimes, though, we end up recycling old ideas without realizing it. 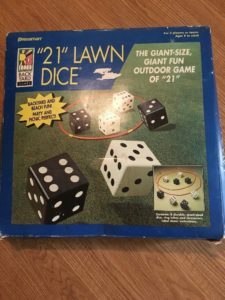 I’ve seen a number of people claim to have had their idea for lawn dice stolen from others. Who made them first? I’m not sure, but it appears Pressman sold their first commercial set back in 1994. Yahtzee’s trademark dates back to 1956. Back in 1965, someone patented lawn dice with finger holes. Chances are that they existed long before that. Archaeologists have found dice games dating back to 2,000-3,000BC. The Romans played dice games and had large and small die. Buddha refused to play dice games. In the early 1980s, the roller skating rink I frequented had giant fuzzy dice that were used in games. Summary: That person on Etsy complaining about you making big dice is an idiot. Trademarking hashtags obviously doesn’t stretch back millennia. Twitter has been using them to group and filter posts since 2009 and irc channels, a grouping mechanism, have been prefaced with # since the late 80s. The notion of trademarking a generic hashtag seems to rest on shaky legal ground as hashtags generally exist because they already are common speech. In 2004, Donald Trump unsuccessfully tried to trademark “You’re Fired” for games, clothes, and other merchandise and was denied. A pottery studio in Chicago with the same name protested, but there was already a game called “You’re Hired” and the USPTO thought there would be confusion. Denied. In 2006, Wal-Mart unsuccessfully tried trademarking the smiley face which had been in use since at least 1972. If you see it in stores now, it’s because they’re apparently licensing it from a Belgian company called The Smiley Brand. Kris Jenner attempted to trademark #ProudMama as she uses it a lot and considers it part of her personal brand, but a jewelry company owned by Jenny Present has a line of products using that name. The proudmama.com domain name has been registered since 1997, although that doesn’t seem to matter much when litigated. Jenner’s trademark application now appears abandoned. On Etsy, there’s always a story about someone getting some variant of a cease and desist because someone is claiming prior art or trademark. 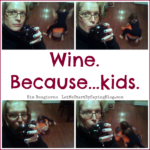 One example is with the hashtag #becausekids. The hashtag seems to have first been used on Twitter in late 2011, then again in May of 2012 and thousands of times since. The domain name was first registered in 2013. The trademark application for “because kids.” is dated 8/9/2016 and states the first commercial use in accordance with the application, i.e. on a glass, was 6/22/2016. That’s 4 years later than the hashtag started becoming common use on the Internet. 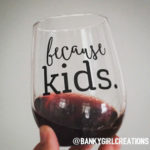 BankyGirlCreations is the registrant and is reportedly contacting other makers of similar wine glasses and requesting that they cease selling them because she’s trademarked those two words being used on mugs and glasses. She also plans to trademark the phrase for use on other textiles. Her other trademarked phrase, coolmom, has been a .com since 1998. Meanwhile, her FB business page launched 9/21/2016 — just a few weeks ago. Thanks for the idea, Hallmark! 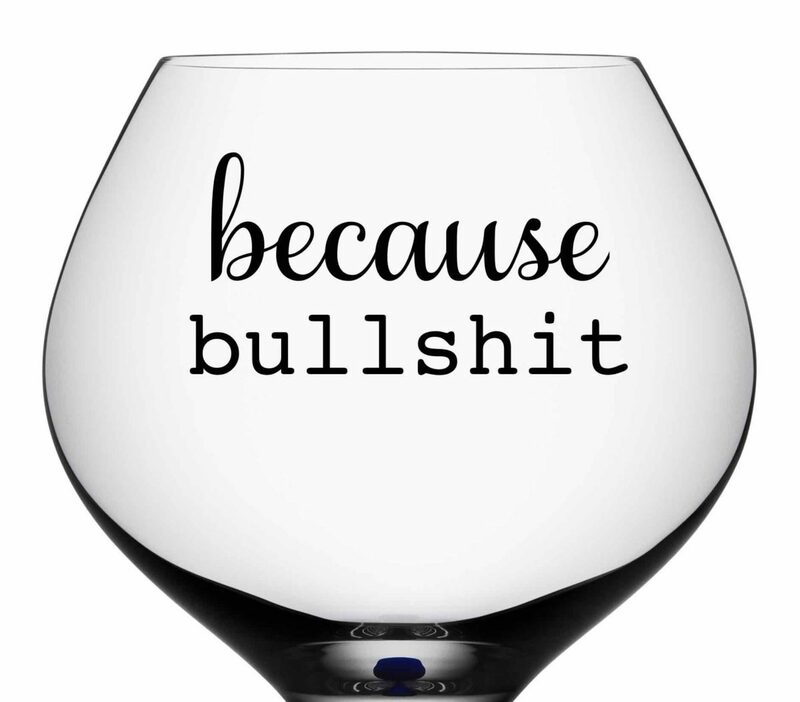 While not exactly the same, I remember seeing this wine glass from Hallmark quite awhile ago Kohl’s still sells it. I found it referenced in an article dated May 2016. That’s before the June date of her first commercial use as indicated on the trademark application, if you’re keeping track. 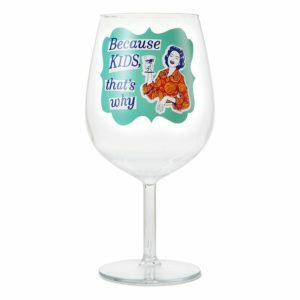 Suffice it to say, a wine glass with “because kids” on it is not a unique idea. The trademark makes no mention of typography, specific colors or fonts. It’s a common, two-word phrase that’s been used on social media for at least 4 years. 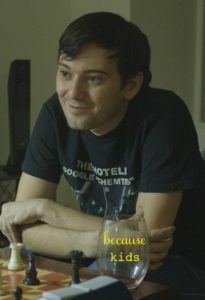 My friends in San Francisco have been phrasing things “because ______” for just as long. She did not popularize the phrase. Much like people no longer say things like “syke” or “not” in common parlance, it’s doubtful that because+noun will endure as a speech pattern. I give this woman props for trying to do things the right way, but trademarking common speech seems like a waste of money and will likely be indefensible if ever litigated. Obey Clothing is a good example of taking a word and making it a brand. They’ve been around since ’89 and I instantly recognize their logo even though I’ve never bought any of their products. There is no creativity or artistic integrity in using a common phrase in common typography on a common object. If building a brand, why not opt for a more generic trademark for product lines and slogans and then spend time building and marketing those product lines rather than trying to personally police the Internet. If your product is ultimately a simplified version of something Hallmark already made before you, you get no cookie. There is no creativity, innovation, or artistic integrity in using a common phrase in common typography on a common object. Attempting to forbid other individuals from doing the same generic thing by invoking lawyers wreaks of privilege and narcissism. Not #coolmom. Your banky is all stanky. Abby Masiello is, according to Stanky Banky’s first Instagram post just a few months ago, the “designer” of these products. 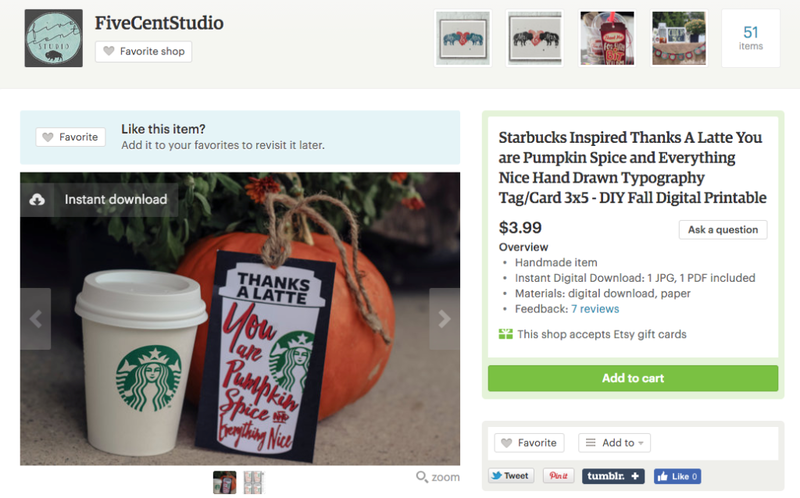 If we take a look at the aptly named Five Cent Studio‘s Etsy shop, we can see she’s using Starbuck’s logos on a lot of her products for sale. Oh, the irony. These two are obviously quality people. You are amazing. Your words are perfect! You are awesome. The crafting community needs to put their collective foot down where the trademarking of common words and phrases are concerned. And frankly, it does smack of a lack of creativity. The shark tank that is Etsy is ridiculous. I for one will never have a store there because I DO have a creative mind and I will be damned if I’m going to make it easy for one of these trademark whores to steal my ideas. Because that is exactly what this is, theft of someone else’s creativity. 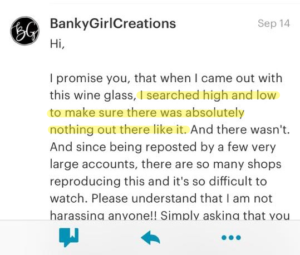 And this Banky chick is jumping the gun, her application for trademark isn’t even approved yet. 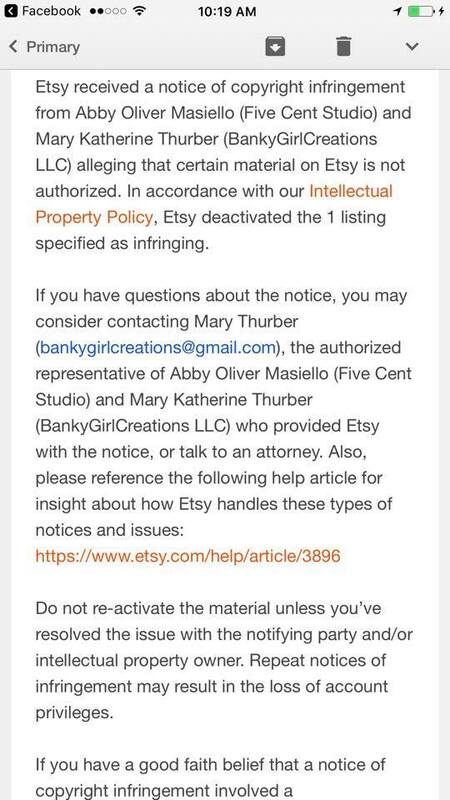 She and other trademark whores like her are what is wrong with the crafting community. And unfortunately, I don’t know what any of us can do about it, although I do appreciate a good shunning. This is terrific!! Love it! Slap in the face. Keep it circulating!